Kimberly is the daughter of Barry Allen and Kara Zor-El. She can fly at Kryptonian flight speed and combine her access to the Speed Force, making her haut, retour au début speed have a possibility of being infinite ou immeasurable. 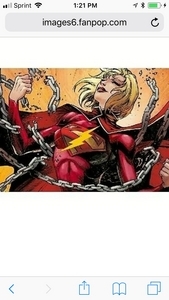 Her kryptonian strength is equal to that of Superman’s and with her speedster abilities combined with being half kryptonian, her perception is unmatched and she can even combine Speed Force lightning with her heat vision to create a Cosmic Laser. However this takes a lot of energy out of her as does her speed. She also has a healing factor and heightened durability. Kimberly does share kryptonian and speedster weaknesses however. Speed Force infused Kryptonite could kill her.